Authors presenting at IMBioC 2019 are invited to submit an expanded version of their papers to a special issue in the IEEE Journal of Electromagnetics, RF and Microwaves in Medicine and Biology (J-ERM): http://ieee-jerm.org. 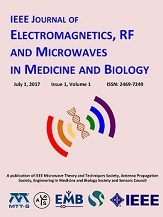 The IEEE Journal of Electromagnetics, RF and Microwaves in Medicine and Biology (J-ERM), sponsored by IEEE MTT-S, APS, and EMBS societies, will publish a special Issue devoted to the 2019 IEEE MTT-S International Microwave Biomedical Conference (IMBioC 2019). Authors of all papers presented at the IMBioC Conference are invited to submit an expanded version of their papers to the special Issue. The expanded version requires that the new technical content reports results beyond the IMBioC paper. Every paper will be reviewed in the same manner as all other regular submissions to this journal. Information of the journal can be found at http://ieee-jerm.org. The focuses of the journal are on unifying the sciences and applications of medicine and biology related to utilizing electromagnetics, radio frequency signals and microwaves/millimeter-waves. If you are doubtful whether your paper is suitable for J-ERM, please write to the editor-in-chief or associate editor of J-ERM, or the Guest Editor of IEEE IMBioC 2019. Authors should be reminded that the overlap of texts cannot be more than 15% and the content should not be more than 40%. Papers should be submitted through the journal’s web page http://ieee-jerm.org leading to ScholarOne ManuscriptCentral. In the menu for “Manuscript Type”, please select “IMBioC 2019 Special Issue”. The submission window will open after the conference. Manuscript is limited to 6 pages maximum without counting the first of Visual Summary page, citation pages, and biosketch pages. The first page should include a figure for Visual Summary and Take-Home messages in bullet-points. The conference paper should be included with the submission as well. The following note should be added to the footnote textbox on the second page: “This paper is an expanded paper from the IEEE IMBioC 2019, Nanjing, China”. The guideline and template for manuscript preparation can be found on the J-ERM webpage. The due date for the paper submission is July 31, 2019. The expected publication date of the special issue is Nov. 1, 2019. The journal is in electronic format so the accepted paper will appear in IEEE Xplore within a few days after acceptance.